Considering the nearly infinite locations available for movies, it's amazing how many are set in New York or Los Angeles. Chicago has a solid collection of releases, but there aren't too many other U.S. cities that stand out for delivering memorable films. One of the exceptions is San Francisco, a city that has been used effectively in a variety of genres. The steep rolling hills are perfect for a chase, and the beautiful bay is an ideal location for romance. The signature icon of the Golden Gate Bridge offers an excellent backdrop and directly identifies the location as this fine city. It also can support a big action scene like the finale of A View to A Kill. The fight between a fifty-something Roger Moore and Christopher Walken is silly, but it's enhanced by the majestic location. Sadly, that unfortunate Bond film did not make this list. Let's take a look at the picks and see if I made the right choices! I'm not a huge fan of Vertigo because of its glacial pace, but it still contains some of Hitchcock's best filmmaking. 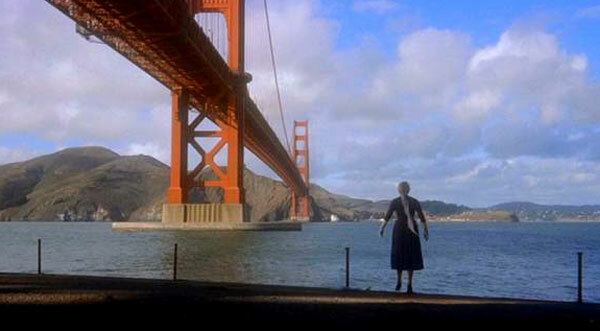 A major benefit is the location, which looks especially majestic in the famous shot of Jimmy Stewart rescuing Kim Novak from San Francisco Bay. It has some flaws but is definitely worth seeing because of the highlights like that scene. I just watched Philip Kaufman's remake of Invasion of the Body Snatchers this week, and San Francisco feels like the right place to watch humanity fall apart. Visually stunning moments like the shot above heighten the tension and make the struggle a grander affair. David Fincher's depiction of the Zodiac killer investigation succeeds because it presents the negative side effects on the guys who become obsessed with the case. Although it had limited box-office appeal, it's the type of movie that should continue to draw new fans on DVD and Blu-ray. Fincher seamlessly presents San Francisco in the 1970s with digital effects that don't stand out. The environment feels realistic with a style that connects to the great police thrillers of that decade. Locations like the police station and the San Francisco Chronicle offices never strike a false note and allow us to focus on the characters. This story feels a lot like Fincher's impressive The Girl with the Dragon Tattoo and does an even better job of getting us intrigued by the investigation. This cop thriller from Peter Yates is known for its famous chase, and that sequence remains thrilling more than 40 years later. One of the main reasons for its success is the use of the San Francisco streets, which provide an excellent backdrop for the high-flying pursuit. Beyond the chase, the story provides an engaging investigation into the botched protection of a key witness. McQueen brings his cool presence to the lead role, and Robert Vaughn plays the nasty politician who seems intent on taking down the detective. There are many familiar elements of the genre in this film, but it still provides great entertainment. John Boorman's stunning revenge thriller doesn't take place entirely in San Francisco, but it includes key scenes at Alcatraz at the start and end of the movie. This deserted prison is the location of the original double-cross that sets Lee Marvin's Walker on his vengeful quest. The cool style and energetic direction from Boorman combine well with the attractive locations to create a kinetic experience. Marvin's determined performance brings just the right menace to make him believable yet keep us in his corner. Fans of Steven Soderbergh's The Limey should find plenty of similarities with this wonderfully edited gem. 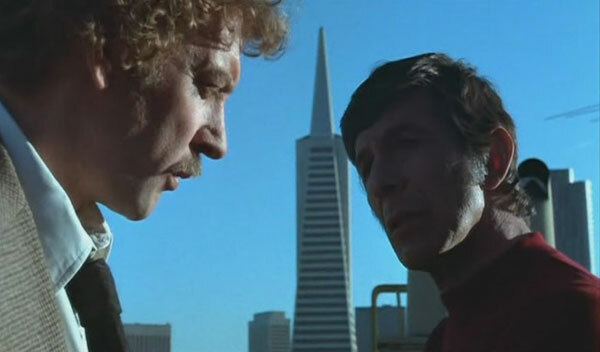 Unlike the previous choice, nearly all of Star Trek IV was shot on location in the San Francisco area. This movie was a major departure from the first three films in the franchise and injected a lot more humor into the mix. The Enterprise crew travels back to 1986 to locate humpback whales to save their Earth. It's a hokey concept but works a lot better than expected. The main reason is the laid-back script, which incorporates fun one-liners into the "fish out of water" story. It stands just behind The Wrath of Khan in my favorite Star Trek films and was one of the most successful offerings. San Francisco provides an excellent setting for the entertaining adventure and is a memorable part of the action. This may be a controversial pick, but I stand behind this silly John Carpenter film for its pure entertainment value. Kurt Russell is perfectly cast as Jack Burton, a goofball who thinks he's the hero of the adventure. Instead, he's a lunkhead who's constantly getting saved by his buddy Wang Chi (Dennis Dun), the true lead of the story. Carpenter consistently subverts our expectations, and it's one of his most entertaining movies. Although it's set in San Francisco, many of the scenes take place on sets created specifically for the film. 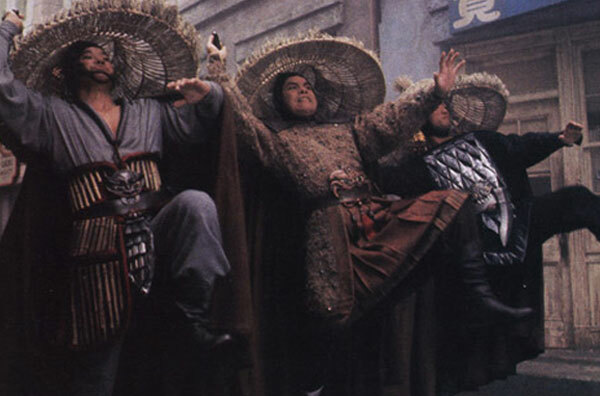 Either way, Big Trouble in Little China is a classic that deserves a lot more attention. Don't forget to submit your recommendations for my upcoming Readers' Choice Marathon! I'd love to hear about the hidden gems that you enjoy and would like me to see for the blog. Good list! Surprised to see a lack of Dirty Harry on here, but that's fine with me. Point Blank is such a good flick. Gotta watch that one again. Dirty Harry's my favorite San Fran flick, so I also wish it would've been here, but otherwise, a great list. Danny and Dave, I like Dirty Harry, but it didn't stand out in my mind as much as these choices. It's been quite a while since I've seen it, so that might be part of it. That said, I can at least see it sliding in for Invasion of the Body Snatchers at the end without a problem. Thanks! Dirty Harry's my #1. Then it's probably the other four Dirty Harry movies. Yikes! Even The Dead Pool? My favorite bit of pop culture to be set in SF is without a shadow of a doubt "Crazy like a Fox". Crazy Like a Fox! I remember seeing that as a kid, though I don't remember it being in San Francisco. It's sad because I just looked it up, and the Golden Gate Bridge is in the credits. Of course, I was only like eight years old. Nice one, Dan! Nice list! For some reason when I think of San Fran on film, all I can think of is Mrs Doubtfire. I much prefer your list of films though so perhaps now I can move on! Pete, that wouldn't be my first guess of what comes to mind for people on San Ftancusco, but it's cool. I saw Mrs. Doubtfire back in the '90s but only remember a few scenes. Hopefully this list helps you to move forward. Thanks! I haven't seen Point Blank. I had forgotten Star Trek IV took place in San Francisco, but it's a good choice. It's a fun movie. 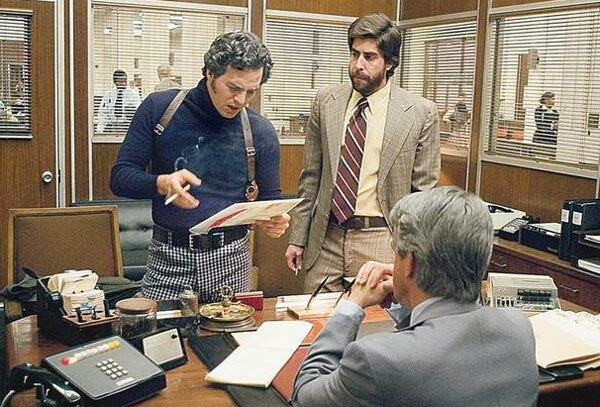 As for the folks mentioning Dirty Harry - there's a funny scene in Zodiac where the real cop who Dirty Harry was based on comments about how ridiculous the Dirty Harry movie was. I like DH well enough, but might not put it on my own list. One movie not mentioned by anyone yet is What's Up Doc? The climax of the film is a huge chase scene around San Francisco and it is one of the funniest sequences I have ever seen. Chip, I'm sure that I've seen What's Up Doc? in the past, but I can't remember it very well. That's a good pick. I'd forgotten about that scene in Zodiac. Good stuff. Thanks! Really great choices you've made here and I commend your pick of Big Trouble in Little China. It is such an entertaining flick! Fond memories of it - I haven't seen it recently sadly! I think Bullitt and Zodiac probably showed off the city at its best. I remember really wanting to go to San Fran after watching Bullitt! Thanks! 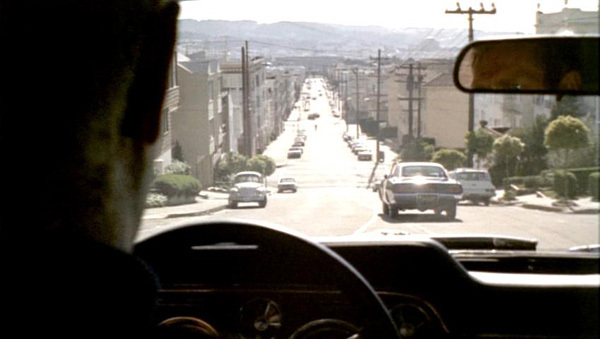 You're right that Bullitt makes great use of San Francisco, especially as the cars speed up and down the hills during the big chase. Zodiac is also amazing, especially since Fincher was presenting the city in a past era. Glad to hear that you're a fan of Big Trouble in Little China. I saw it as a kid and liked it, but I was surprised by how much I enjoyed it as an adult. There are a lot of things that flew over my head! Another great, unique list. Love Zodiac, love Bullit. Have you seen the documentary, The Bridge? 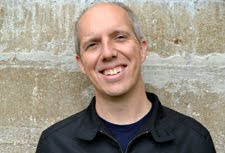 Basically, this dude filmed the Golden Gate Bridge from afar every daylight minute for one full year. I think he caught about 20 suicides on film. It's a really eery, good doc. I haven't seen The Bridge, though I've heard that it's a pretty sad experience. My wife actually brought it up when I was telling her about doing the San Francisco list, but I haven't caught it yet. I definitely need to check it out at some point. Thanks Alex! Eric, I can't believe that I totally forgot about The Room. I have seen it, and it's so ridiculous and definitely lives up to the hype. You are tearing me apart Lisa! Great idea for a list - NY and LA get most all of the action, but there are some great ones set in SF. ...Sadly, I've not seen either of your honorables or #3 and #4. Star Trek 4 might have to be my top choice, though really, aren't all of the (original) Trek films based at least partly in SF? Isn't that where the Federation or wherever is located? SF shows up for sure in the 2009 version as well. My mind went first to Basic Instinct and then to The Game. Actually, BI might be my #1. So much of the city (and surrounding areas) is covered, and it's a kickass film to boot. Michael Douglas must love him some SF. Dylan, The Game was right on the edge of my list. It was really hard to kick it out, but I couldn't figure out what to drop. I think The Game is one of Fincher's great forgotten movies. I'm surprised that you haven't seen Bullitt or Point Blank; both seem right up your alley. Point Blank has been very influential on Tarantino, Soderbergh, and many others. It's been a while since I've seen Basic Instinct, so I can't say that it really was considered. It might be something I should revisit at some point. For Star Trek, the Federation is in San Francisco, but I picked Star Trek IV because basically the entire movie is in SF. The others (except III) have maybe a scene or two in SF, but it isn't very important to the story. Thanks Pam! I totally see the issue with getting distracted by the locations in San Francisco. This also can be trouble in movies set in Paris or other gorgeous European cities. It's been a while since I've seen Nine Months, but I understand what you mean about light-hearted films like it being easier for SF views. Hi Dan your list has proved great use for me over the past few days, I've watched all films I hadn't previously seen on your list. I've visited SF twice and I intend to come back very soon, certainly my favourite city. The only change I would make to your list would be Star Wars, instead I would include Escape From Alcatraz. I know you don't get to see much of the city but being shot at such an iconic landmark is enough for me. It's great that you've been able to watch some of the movies on this Top 5. I'm sad to admit that I haven't seen Escape from Alcatraz, but it's on my list. Having it take place at the famous landmark is definitely good enough to be considered. Thanks!